Type Locality Rio Hyavary, Peru-Brazil border. Etymology (Greek)Pimele=Fat + (Greek)odous=teeth. 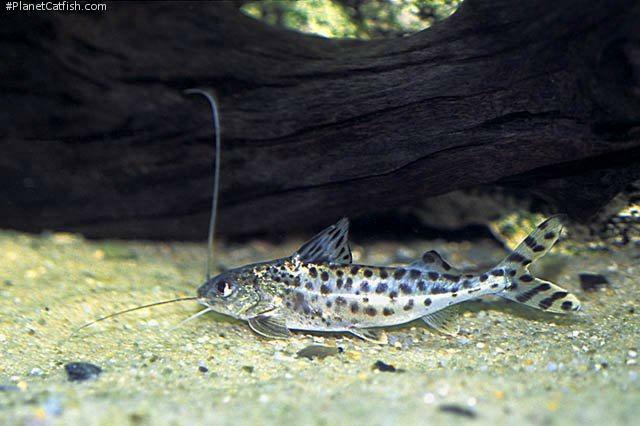 This specific epithet literally means painted(pictus=painted) and refers to the spots on its body. Identification Two colour forms appear for sale. The first, Peruvian, variety has large ''dalmatian'' style spots all over its body with smaller spots around the head. The other, Colombian, variety (which reportedly grows larger) has many more spots that are smaller, less clearly defined and almost pin-prick size on the fish's head. This differentiation should only be used when comparing fish of a similar size as both patterns change with age. General Remarks Pimelodus pictus have small hooks on the dorsal and pectoral fins that are notorious for getting stuck in nets. It's best to use a plastic container to catch the fish, rather than a net. Distribution Amazon and Orinoco River basins: Brazil, Colombia, Peru and Venezuela. Feeding An unfussy general carnivore. Most prepared are taken and the fish will gorge itself on live or frozen foods to a point where the aquarist must be careful not to feed too much in one sitting. Bloodworm induces a feeding frenzy and is good for acclimatizing new acquisitions. The fish will eat huge amounts in one day, its belly swelling to resemble a marble and can happily live off this for up to a week. In nature the diet consists largely of invertebrates (such as insect larvae and crustaceans), but also found to eat fish. Furniture Swimming space is needed as this fish likes to swim especially around feeding time. You will see much more of this fish during the day if you have relatively dim lighting. Compatibility Peaceful, but will soon eat smaller fish, such as neon tetras, but otherwise harmless. It is considered good to keep these fish in a group of at least five fish. When kept alone, they do not appear quite as happy and active as when kept in a group. Suggested Tankmates Larger active fish such as tetras and gouramis. Most barbs are no good company as they tend to nip fins and barbels. They should be kept in (small) groups. Most singly kept specimens will pine away eventually. Angelfish and other ''graceful'' fishes may be bothered by this species' barbels particularly during lights-out. There are 234 registered keepers, view all "my cats" data.